If you are looking for flowers, perennial plants are the most varied group that any gardener could wish. They come back year after year, are colourful, flowering, have great foliage are you can find tall and low growing varieties. 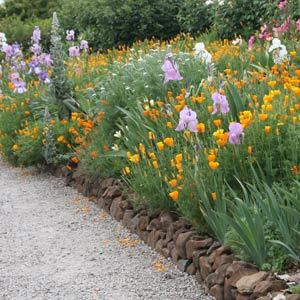 A favourite group of plants for both formal and informal borders as well as cottage style gardens, we have gathered the perennial plant nurseries in Australia, all the in the one place, here at Nurseries Online. A perennial plant is any plant that lives for more than 3 years. Perennials exist as both as ‘woody perennials’ and ‘herbaceous’ perennials. However most gardeners think of perennial plants as the herbaceous type, those that die back each year to reappear in spring. Many perennial plants will grow well full sun others are shade loving perennials, some will provide flowers in dry shade. Perennial Plants are defined as those that live for more than two years. Woody perennials are those that develop a woody base and root system, flowers and foliage develop on the woody base each year. Available as potted specimens throughout the year or as bare rooted plants during dormancy we present you with the best selection of perennial plants that you can buy in Australia, all the perennial flower nurseries in the one place, here at Nurseries Online. How to plant and grow perennial plants will depend on how you buy the plants as to how and when you plant them. Bare rooted plants are generally sold in the winter months as this is the dormancy period for most species. Plant as soon as you receive them making sure you prepare the position well before. Individual species will require different soil conditions and aspect, some require damp positions (Astilbe, Rodgersia, Gunnera and Others) many require a moist but well drained soil. Remember to meet sun requirements, again some plants require 6-8 hours of san day as a minimum, other prefer part shade or dappled shade. Watering is similar, some perennials require a lot of water, others very little, so look for specific information. A Comprehensive list of perennial plants for the Australian garden is almost impossible to compile. So for lists we suggest you might like to browse the online catalogues, or check out the rare plants section for some really interesting and often hard to get perennial plants.